In Hängung #20, for the first time, KUNSTWERK presents works from Polynesia. Around thirty bark cloths produced in the 19th and 20th centuries come from Samoa and Tonga, Futuna, Niue and the Fiji Islands. A look to the present here leads to New Zealand, for example in the works of Darryn George and John Pule, whose paintings reflect elements of Pacific history and culture. Indigenous works have formed a specific focus of Sammlung Klein for a number of years. Paintings and objects from indigenous Australians have previously been presented several times at KUNSTWERK. 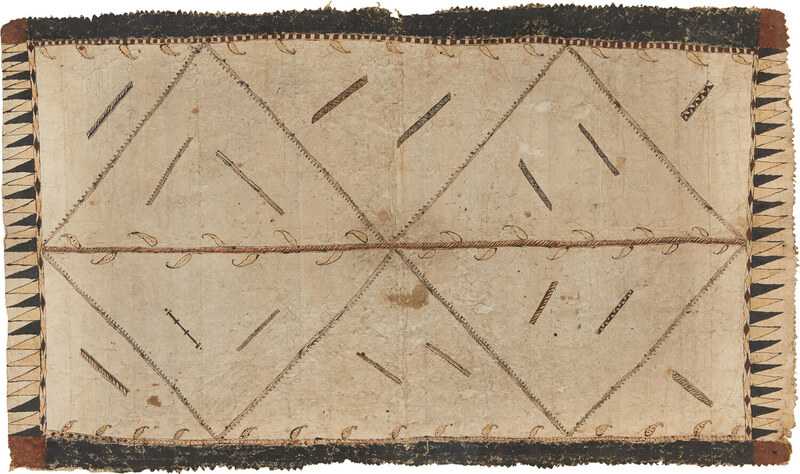 By contrast, the bundle of Polynesian bark bast cloths held by the collection has never been presented to the public before. With them, the gaze moves beyond the Australian continent to the wider territory of Oceania. The bark cloths – also called tapa – were made only by women. The cloths were not woven but rather beaten on wooden anvils, out of bast from bark, to produce fine textures, printed with stencils or pattern boards, or painted by hand. They were traditionally used in many ways and in varying quality. They served as clothing or as fabrics in domestic use but they also formed part of ritual ceremonies. At high feasts, large and elaborately designed panels were a testament not only to status and esteem for their owners but also confirmed and expanded – divided into pieces as a gift to guests – the existence of social relationships. 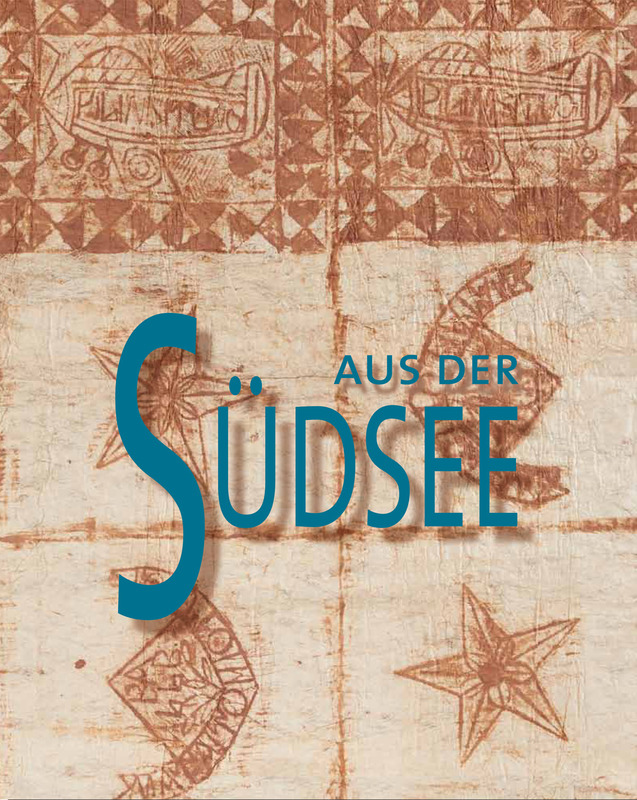 As historic or contemporary artefacts they equally trace a picture of the cultural traditions in the Pacific, some that have died out, some that are still in existence today, and some that have been revived. After the opening with contemporary art from New Zealand, Hängung #20 presents bark bast cloths from Oceania, which are among the most expressive groups of works produced by the Polynesian cultures. Different forms of use and design are appear here in the individual regions. Wednesday, 03. April | 3 p.m.
Sunday, 07. April | 11 a.m. and 3 p.m.
Easter Monday, 22. April | 11 a.m. and 3 p.m. 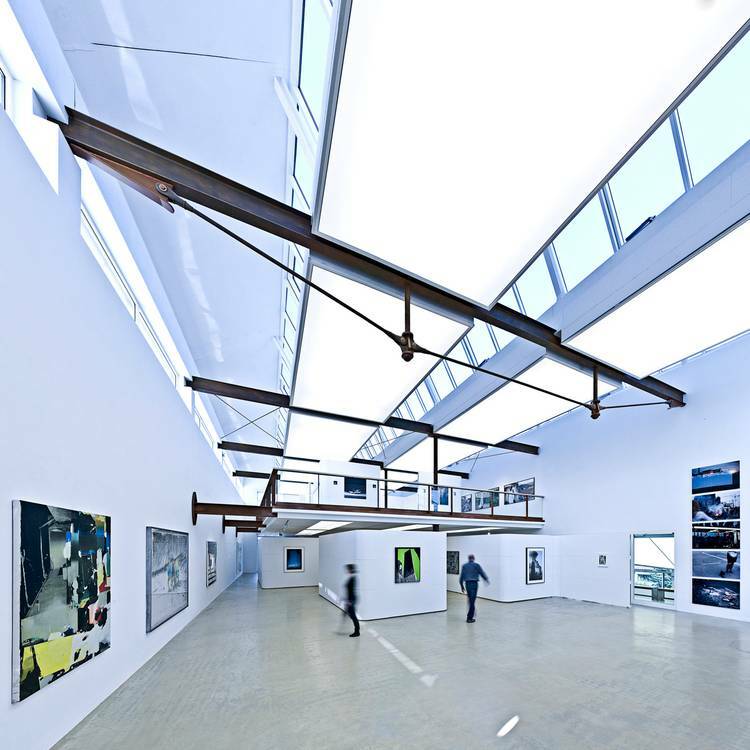 Opening hours CafeK since end of April from 1 p.m. to 5 p.m.
Alison and Peter W. Klein have exhibited their art collection in the museum designed by Folker Rockel since October 2007. Good Friday, Easter Sunday and Monday, May 1, Ascension as well as Pentecost Sunday and Monday. An 68 pp catalogue (German) is published for the exhibition Hängung #20 – Aus der Südsee with text by Dr. Ingrid Heermann and Valeria Waibel. Available at KUNSTWERK or order via Email kunstwerk@Sammlung-klein.de (plus additional shipping cost). SWR programme KUNSCHT! visited Sammlung Klein in Nussdorf, as well as the collections exhibition at Kunstmuseum Stuttgart.